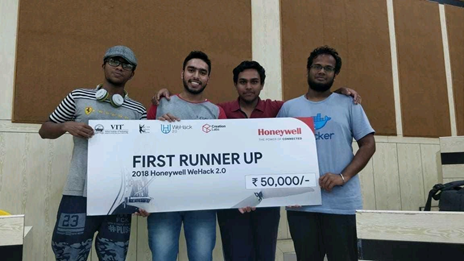 Developer Student Club VIT, one of the most prestigious technical chapters in Vellore Institute of Technology has created a name in the technical domain for not just conducting the hackathons but also winning them. We at DSC VIT believe that hackathons give the participants a platform to test their ideas with their technical skills to build something new and exemplary. 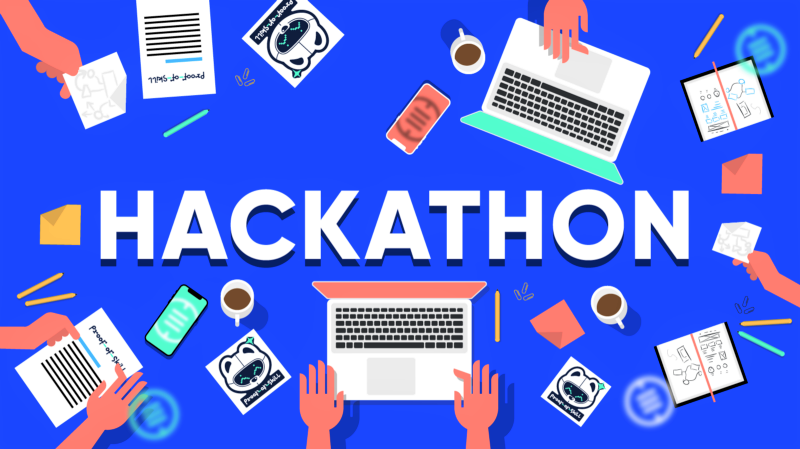 Student hackathons are a great destination for students to implement their knowledge into projects that they believe in. Our chapter has always come forward and actively grabbed every opportunity to be a part of not only hackathons but also other technical events and competitions. The enthusiasm never seems to diminish when it comes to learning and succeeding. Last year has been a splendid year of brainstorming hackathons for the members of the Developer Student Club. The members learnt a lot in their respective domains and had a great experience participating in them. 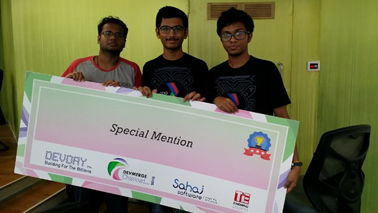 The hackathon was conducted at IIT Madras Research Park by Sahaj Software Solutions on the 27th and 28th of October. The winners were presented with an iPad and for special mention, the participants were given a Kindle. This competition organized by one of the most prestigious IITs was a tough task but our hack-squad left no efforts to bring out the best in them. PIC 1 — From L to R: Jaivarsan, Vikrame and Shaaran :: PIC 2 — Paritosh in the left with a smile along with Vikrame and Jaivarsan. The 2nd Prize which was the Special Mention of the event in Al category was won by — Jaivarsan B, Vikrame Vasudev and Shaaran LB. 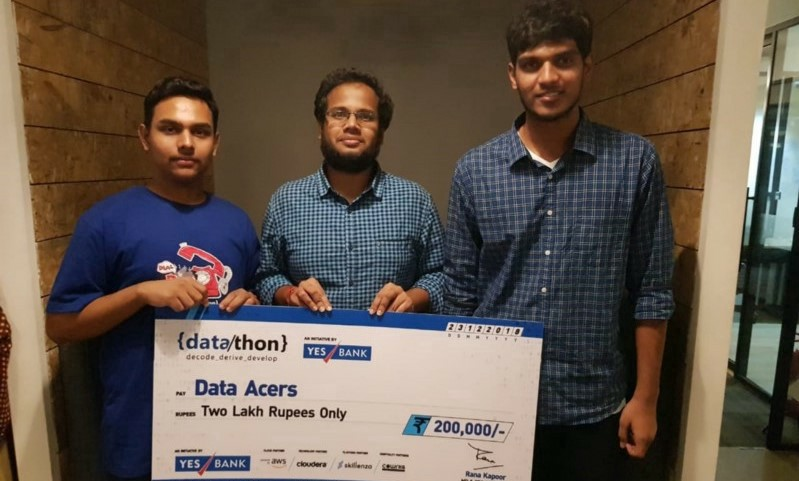 Paritosh Mahajan, a member of DSC VIT was a part of the winning bunch in this hackathon. The hackathon was organized by the Creation Labs of VIT. Partnered with Honeywell, it was conducted on the 8th and the 9th of September, 2018. It was challenging to compete with brilliant minds which gathered from all around the country but the amazing team of DSC VIT ultimately emerged as the First Runner Up. The winning team members include Jaivarsan, Paritosh Mahajan, Yashwant Narayan and Shaaran LB. 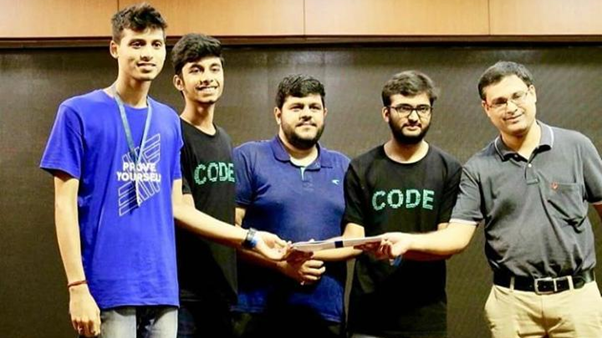 It was organised by CoWrks RMZ Infinity, Bangalore on 22nd and 23rd December and our technical team emerged as the first runner up and won a cash prize of 2 lakhs. Datathon was a long process, it started during Diwali where the participants had to submit an online submission of a test set provided to them. It was a classification and a regression problem and only the top 50 were selected for the next round. Our team was outstanding and came 9th in regression task, and 21st in classification task out of 1500+ teams. Next, they were invited for a mentoring session, where they were given proprietary data. The team picked the bank transaction data and built a community detection model on top of it which helped them in making customer recommendation and customer attrition. “Make your crazy idea become a reality” was splendidly demonstrated by our mighty developers! A hearty congratulations to Jaivarsan, Yashwant and Shaaran. Hackference was conducted by Google, GitHub, XinFin, ABinBev, GMetri on 15th and 16th of December. 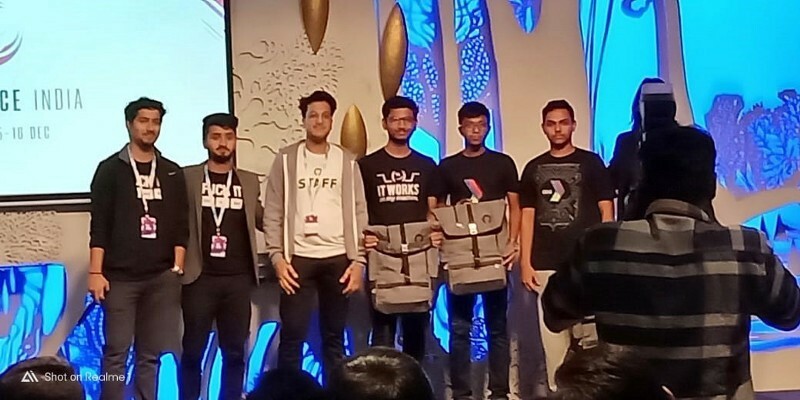 Our chapter’s team named Swarm received a prize for the Best Innovator Award for AI-powered smart glass to make it as daily wear and received a lot many prizes worth INR 1.5 Lakhs which included GitHub credits, schwags and official Git bags. Yashwant, Vikrame and Shaaran were a part of the winning squad and it just encourages fellow developers to achieve such great heights in future. 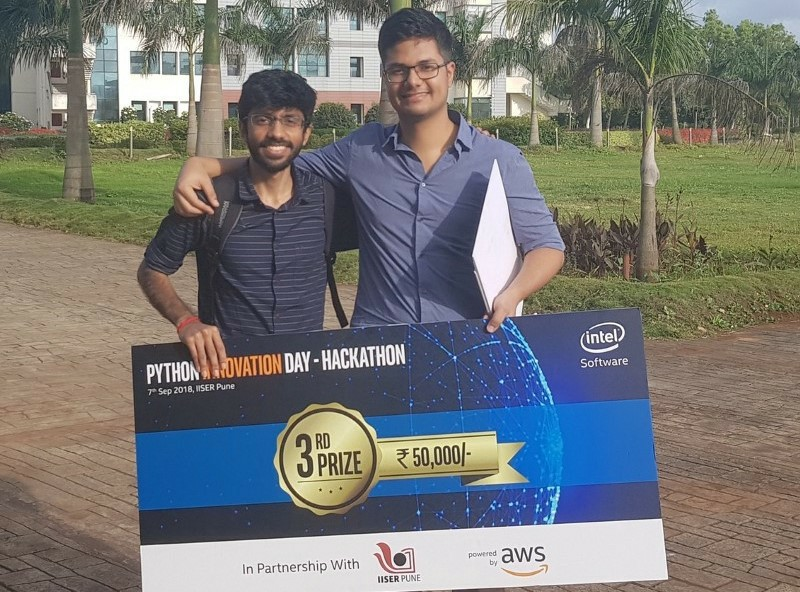 After a gruelling 3 months online challenges and 2 days, long offline hackathon organised by Intel with over 3000+ teams from all over India showcasing state-of-the-art HPC products leveraging Intel Technology, we emerged as the 2nd runner up in the competition. Winners of the Hack, Amrut and Shubham! We are proud of Shubham Bhardwaj and Amrut Phadke for their fabulous project idea and implementation. Digifest 2018 was conducted in Jaipur, Rajasthan and the DSC VIT’s member Dhiraj was the part of the winning squad and they were awarded the best blockchain project and an award for the best startup idea which had a great social impact. Their idea was to create a decentralised electricity distribution system for renewable sources of energy. 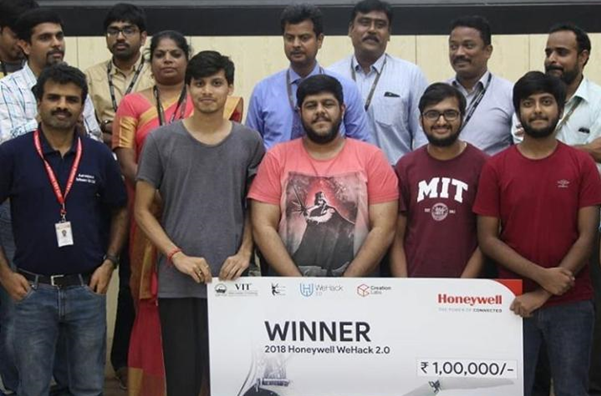 The Honeywell’s WeHack 2.0 was conducted in Vellore Institute of Technology in collaboration with Creation Labs. 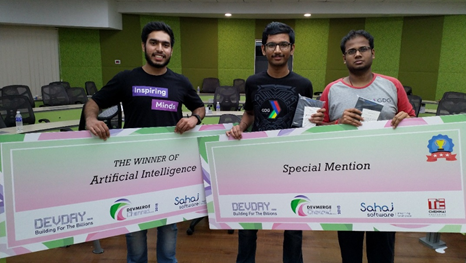 We are proud to say that the technical member of our chapter, Dhiraj along with his fellow mates grabbed the 1st position, winning a cash prize of INR 1 Lakh. The project made was the compiler for C which shows the real-time execution status of any code and it was a web-based application which can run on any environment and platform. Code2Create was conducted in March 2018, by ACM VIT. Dhiraj, the technical advisor of DSC VIT was part of the team that bagged the 2nd Prize in this tech-marathon. They created an innovative project which consisted of a Solar System simulator that gives a VR experience on the Web. Their project was highly appreciated for its brilliant approach and a unique implementation. Dhiraj Jain in the centre. This 36-hour long hack conducted by the Computer Society of India, VIT Vellore was highly competitive in the domains of Fintech, AR/VR, Artificial Intelligence and more. Dhiraj along with his team was felicitated with the Best social project award for its creative and out-of-the-box idea. It was based on the Blockchain implementation of a community-based farming system for making it operable in India. Dhiraj Jain, 2nd from the right. 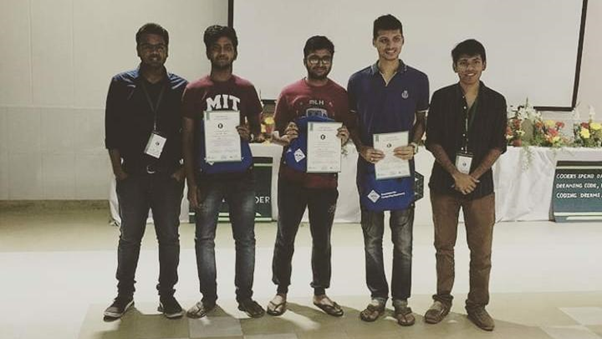 Dover Hack in Coimbatore conducted in the Think-o-fest by KCT college in August 2018. We have been roped in as a delegate for paper presentation in IBM Code day in Feb 2018. Best idea of a startup by Cowrks in Angel hacks 2018, Chennai. Project collaboration with Tamil Nadu Electricity Board for the research paper, presented in an IEEE conference in Anna University. We have been shortlisted for the top 25 best blockchain projects by Accenture. There is a huge misconception that in order to participate in hackathons, you need to be a great programmer but that’s not the case! Just come up with new and creative ideas which you think might help create a change around you and you are good to go! We at DSC VIT have always kept in the best that we have in ourselves and have always worked for the development of the present for a better future. We congratulate all the winners and wish them good luck for their future endeavours! You can read Dhiraj Jain’s blog on his experience of hackathons here. Until next time, keep coding!